Here's all the random stuff that's not a movie, a link, or a Newmaps. Orthanc - A giant model of Orthanc, made out of LEGO bricks. WAZZUP!!! - A Chex Quest machinima based on the classic WAZZUP!!! commercial. Man of Science - A series of screenshots taken in Garry's Mod of Dr. Kleiner doing silly stuff. Reports - Some reports on stuff. Art - Some artwork I've made. Whaleware - The officially official Whaleware website. 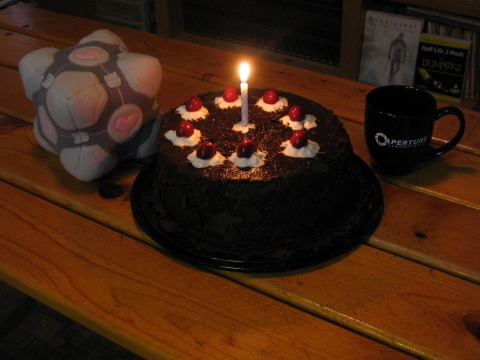 This is a picture from my 18th birthday party, showing the Portal cake, the Weighted Companion Cube, my Aperture Laboratories mug, and a couple Half-Life books in the background.